Shrimp Chow Mein is a no pain, no fuss, easy one pot meal that gets ready under 30 minutes. Take away? Say “No!” to them and enjoy this soothing Cantonese style Chow Mein like a Boss at your home this weekend! Here is step by step and Video recipe on how to make the best Shrimp Chow Mein Cantonese Style. What is Shrimp Chow Mein? Shrimp Chow Mein is a classic Chinese (Cantonese Style) dish made with egg noodles and a plethora of veggies, protein and sauces. Simple, stir fried and just in one single pan, this toss it all up fried noodles are very tasteful. Rightfully so! Because it has a bit of everything. Right from green onions, bean sprouts, sauce mixture like soy sauce, oyster sauce till protein like shrimps and fresh veggies like carrots, bell peppers. One bite from a small bowl of this Chow Mein and you are sure eating a great meal! The secret to make great noodles at home is to keep all the ingredients handy and use a light wok or pan on high heat. The reason behind doing so is that you get to maintain the nice flavour and colour of veggies. Also, the noodles don’t turn lumpy then. Now Chow Mein to most people around the world is crispy noodles stir fried with veggies. But in India, it’s cooked noodles tossed with sauces and veggies and shrimps or chicken. I am not sure about what you should call this recipe but I can promise that this one tasted awesome and you should definitely try it. 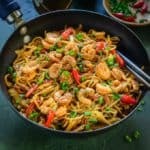 How to make Shrimp Chow Mein? Got all the ingredients by your side? You will make this simple, sizzling Cantonese Chow Mein in just 20 minutes then! Start by marinating the shrimps with salt, pepper and lemon juice. Mix all the mentioned sauces in a bowl. Boil the egg noodles. Now the final step: saute and toss all of the above. Finally serve this slurpy one pot meal with a garnish of fresh onion greens and sizzle your routine meal with some sauce, noodles and awesomeness. Cook the noodles until they are just done. Over cooing them will make them mushy. We are aiming at just cooked noodles here. If you are cooking your noodles beforehand, then toss the cooked noodles in some oil to avoid them sticking to each other. I sometimes runs them under cold water just before adding them in the wok. It immediately separated the noodles and they are much easier to manage. You can use any vegetables that you want to make this Chow Mein. Try experimenting with mushroom, spinach, bokchoy, zucchini etc. If using vegetables like broccoli or cauliflower, blanch them before adding them in the recipe. You can also add some shredded chicken to this Chow Mein. The amount of sauces can be increased or decreased according to your taste. Use a light wok to make these noodles and make the Chow Mein on hight heat. It should be a quick stir fry. Use a pair of tongs or chopsticks to toss everything together. If you have cooked the noodles before hand and they have stuck to each other, just run them under cold water, they will be separate again. Make sure to make chow mein in small batches to give it a nice flavour. Which noodles to use to make Chow Mein? Egg noodles are the best to make Chow Mein. You can also go for packets labelled with Hongkong Noodles, Chow Mein Noodles or thin wonton noodles. These noodles are par cooked and you just have to cook them again in boiling water for a minute. The two dishes are quite similar with some minor differences. Here is an article that explains it nicely. 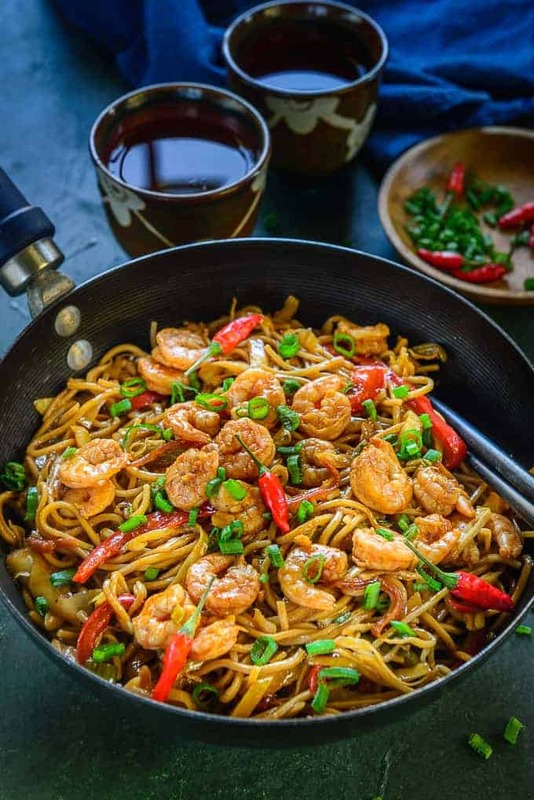 To make this one pot Shrimp Chow Mein, You will need a light wok and a tong to mix up the noodles with the veggies and sauces. Add all the ingredients for marinating the shrimps in a bowl and mix well. Keep aside for 15 minutes. Mix all the sauces in a bowl and keep aside. Heat vegetable oil in a wok. Once the oil is hot, add ginger and garlic and fry for a few seconds. Add the shrimps and cook for 2 minutes..
Add carrot, cabbage, bean sprouts and bell peppers and fry for a minute. Now add the noodles and sauce mixture and toss well to mix everything together. Add salt to taste and cook for a minute. Garnish with spring onion greens. 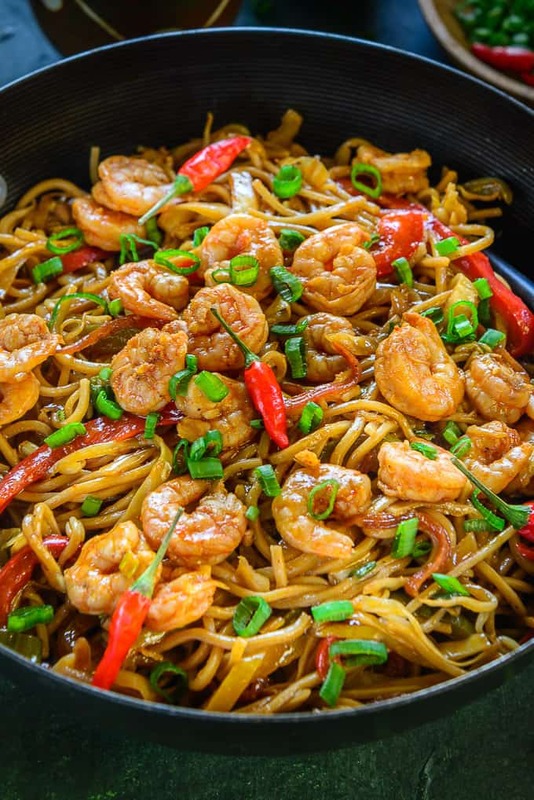 Shrimp Chow Mein is a no pain, no fuss, easy one pot meal that gets ready under 30 minutes. Add the shrimps and cook for 2 minutes. Add ginger, cabbage, bell peppers and bean sprouts and fry for a minute. Now add the noodles and sauce mixture and toss well to mix everything together. Add salt to taste and cook for a minute. I have been following you on Instagram from few months! I love your website and how get into each detail of the recipe! This dish looks so good, I would love to have this Chow Mein for dinner, with so many vegetables, shrimps and noodles. Truly easy and satisfying recipe! Thnx Alina. I am sure you will love it.